On March 6, 2019 the Copyright Board appears to have turned over one new leaf by asking for comments more than three years after the close of the hearing from “affected persons” on the “feasibility and clarity of the terms of the tariff” with respect to Access Copyright’s proposed tariffs for the Post-Secondary Educational (“PSE”) Institutions. I reported on this here. Those entitled to comment potentially included lots of people and institutions that may have withdrawn from this nearly nine-year-old saga or may even have never engaged. In the past, the Board has limited acceptance of comments to a short window following the close of the oral hearing. The invitation resulted in 11 submissions, which have conveniently been made available here from the Board itself – a helpful and timely development and another new leaf in itself. (Publishing filed court and tribunal public documents is a crucial component of access to justice). From the users’ point of view, these submissions feature a comforting degree of consistency and, at the same time, a considerable degree of independent analysis and approach. During the hearing before this Court, counsel for the interveners the Centre for Intellectual Property Policy and Ariel Katz briefly raised concerns regarding the Board’s power to issue retroactively binding decisions in general. That issue was not squarely before this Court in this case, and I do not purport to decide broader questions concerning the legitimacy of or limits on the Board’s power to issue retroactive decisions here. CARL also mentioned the Board’s own 2008 decision in SOCAN 22.B to 22.G Tariffs wherein the Board found that it would be “highly disruptive, and therefore ipso facto unfair” to certify a tariff that, among other considerations, was for a period (1996 to 2006) that is long past.“ This decision was upheld by the Federal Court of Appeal in Society of Composers, Authors and Music Publishers of Canada v. Bell Canada, 2010 FCA 139 at paras. 20 and 26, a case which I argued. I’ve discussed the Maple Leaf case before. Clearly, the Board has not proceeded “with all possible expedition” in this nine-year-old proceeding and it would seem inconceivable that there could be any reasonable basis to justify a nine-year retroactive tariff as a “practical necessity”. The University of Toronto has wisely submitted that “The effect of the extreme delay in the present case raises a series of issues that merit full, transparent and detailed review, with input from any affected party, before a final decision regarding the tariffs is made.” In light of the case law, any retroactivity in this instance may be vulnerable. There are a number of possible twists and turns ahead on both the “mandatory” and “retroactive” issues. We should get some guidance on the “mandatory” issue in the next weeks or months from the Federal Court of Appeal in the appeal of the York University case, where the issue loomed large, although it was not addressed as fully as it would have been if my client CARL had been allowed to intervene. In any event, this “mandatory” issue may very likely end up in the SCC, unless Parliament clarifies the law as enunciated by the SCC as I have suggested to the INDU Committee. e. The overreaching and intrusive records and reporting provisions. Overall, these 11 submissions raise some existentially important points in the terms of the “feasibility” of these tariffs. If the Board intends to approve a tariff that can survive judicial review and/or be enforceable, it may need to turn over even more new leaves, as it were. Maybe that will involve rediscovering the Maple Leaf, as in the landmark 1954 SCC Maple Leaf decision. 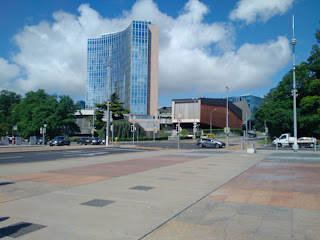 And following the 2015 SCC decision in CBC v. SODRAC – which would indicate that, if a tariff provided pursuant the voluntary “arbitration” regime is not mandatory, then a fortiori, the use of the general regime cannot result in a tariff that is mandatory as against unwilling institutional users who clear their copyright obligations more efficiently in other ways. How can it be that such an institution, which may have inadvertently made even only a single copy of single work in Access Copyright’s repertoire in manner that might amount to technical infringement, be liable for millions of dollars for maybe tens of thousands of FTEs for the term of the tariff? And here’s another potentially crucial issue. If the current proposed tariffs start to involve constitutional issues, as the redoubtable Prof. Katz suggests in his submission, – given that education is a provincial power – we could see some interesting arguments about a concept much beloved by the SCC known as the “living tree”. And at the risk of reopening Canada’s national anthem debate, I include a wonderful rendition of “The Maple Leaf Forever More” by the legendary and world-renowned Canadian tenor Edward Johnson (1878 – 1959) – who became the manager of the Metropolitan Opera in New York and whose name is on the Faculty of Music building at U of T, where I played at the opening ceremony and spent many years. WIPO has been trying to promote a broadcasting treaty now for about two decades. The 38th Session of the SCCR opened with an unusually explicit call from Director General Francis Gurry to push this forward soon to a diplomatic conference. Here is the first session, where he delivered the opening remarks. While the world could benefit from a successful return to multilateralism on the IP and other fronts, a badly conceived and unnecessary treaty will not be helpful. I attended SCCR 36 last May on behalf of the Civil Society Coalition and this is what I said at that time. 1. Will Canada oppose post fixation rights for broadcasters, and if not, why not? 2. Does the proposed text in SCCR/37/8 deal with the “internet”? What is meant by “computer networks” in the definition of “broadcasting”? 3. Will Canada support or oppose extending the broadcasters’ right to works that are (a) originated on the Internet, or (b) made available on demand, over the Internet? 4. Will Canada support or oppose a post fixation right for works where copyright has expired, or which are not protected by copyright? 5. Will Canada limit the broadcasting right to traditional television and radio delivered without encryption and paid subscriptions? 6. Can Canada allow countries to impose formalities on the right, if they want, as they can under the Rome Convention? It is important that Canada stand up and be counted. Our delegation is well informed. However, both domestic and international audiences need to know where Canada stands. Canada’s profile at WIPO has been too low for too long, as I have pointed out in this book chapter for CIGI. An interesting and potentially very important copyright case is about to the heard by the Supreme Court of Canada on appeal from the Ontario Court of Appeal in the Keatley v. Teranet case. Here’s the SCC’s summary – which is not official but which is concise and useful. Here are a few points to note. 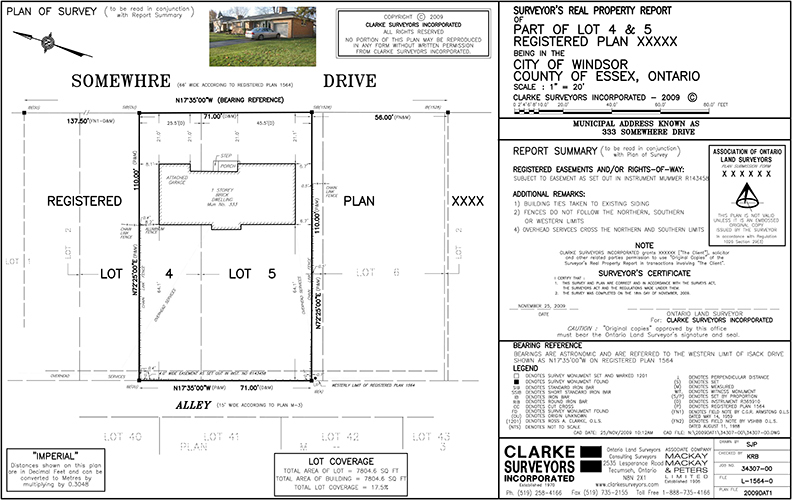 The case concerns copyright in land surveys – which are an essential element in Ontario of proof of land ownership and which are a key component of all real estate transactions. 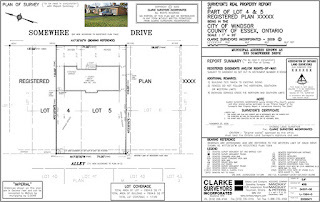 These surveys are required by law and required to be registered on title and the Government of Ontario has privatized key aspects of the land registration system to an entity known as Teranet. The case is focussed on crown copyright and s. 12 of the Copyright Act. Teranet, which is resisting the payment of additional fees to surveyors beyond that which they were paid originally for doing the survey – has never disputed the notion that copyright subsists in land surveys. Indeed, the two actual parties (Keatley and Teranet) agreed for purposes of this litigation that copyright so subsists, although this crucial issue is far from clear and certainly not obvious. There are a number of interveners in the case, who are providing valuable and essential input under the relatively new intervention constraints which permit at most a 10-page factum and five minutes of oral argument. Here is a link to all the factums. Particularly noteworthy IMHO are the intervener factums of the Attorney General of Canada, Canadian Association of Law Libraries, CANLII and the Federation of Law Societies, and the Centre for Intellectual Property Policy + Prof. Ariel Katz. Also, of great interest, is that that similar and related issues are pending in the case of P.S. Knight Co. Ltd. v. Canadian Standards Association, 2018 FCA 222, recently decided in a split decision by the FCA favouring the CSA. This case concerned whether copyright exists and is enforceable with respect to privately developed electrical safety codes that become incorporated by reference into Canadian law. The decision was rendered on December 7, 2018 and CSA predictably quickly sought and has been granted leave to intervene in the Keatley case in the SCC. Surprisingly, however, P.S. Knight, did not even try to seek leave to intervene in Keatley, although it has asked for leave appeal its own case to the SCC. Although the Knight decision has been referred to and the obvious issue of access to justice has been raised in some of the intervener material, the Knight case might have forced this issue to the forefront. Clearly, these two cases will not be heard together – which might have been a possibility and arguably would have been ideal. Moreover, it is entirely possible that leave to appeal won’t even be granted in the Knight case. In any event, it is very likely that, if normal timelines are followed, the Keatley case will be decided long before the Knight case is even heard, assuming that P.S. Knight gets leave to appeal. In any event, and without involvement of P.S. Knight, the Keatley case will go forward and will be heard on March 29, 2019. The webcast will be available here. On February 19, 2019, I published a blog about how the Board was seeking comments from the “Parties” on the proposed draft tariffs sought by Access Copyright for the post-secondary sector. The Board confirmed to me that the only “Parties” were Access Copyright and Mr. Sean Maguire, a self-represented student. The Board kindly provided me a copy of the draft tariffs, which I posted on that blog. The Board wishes to consult affected persons on issues of tariff wording before proceeding to certification. The Board seeks comments on the two attached draft tariffs, for the periods of 2011-2014 and 2015-2017. The text of these tariffs is based, respectively, on the 2012 AUCC Model Licence (Exhibit AC-2V), and the University Three-Year Premium Licence (Exhibit AC-23N), which are attached. Affected persons shall comment on the feasibility and clarity of the terms of the tariff. Comments may be informed by the attached comments of the Parties to this proceeding: Mr. Maguire and Access Copyright. Portions of the draft tariffs in respect of rates and interest factors have not been included in the attached versions. Any affected person wishing to comment on the draft tariffs may do so by no later than Friday, March 15, 2019, by sending their comments to the Board. Any comment should be no longer than 3 pages in length. The Board will subsequently provide Parties to this proceeding with all comments received pursuant to this Notice and provide an opportunity to reply thereto in a separate notice. For the convenience of readers who didn’t get the mail, here are links to the 2012 AUCC Model Licence (Exhibit AC-2V), and the University Three-Year Premium Licence (Exhibit AC-23N) and the comments of Access Copyright and Sean Maguire. The above email of March 6, 2019 now appears as a Notice on the Board’s website, but without the attachments. Earlier today Counsel for Universities Canada requested an extension to Wednesday, March 27, 2019, of the March 15, 2019, deadline for comments set out in Notice 2019-013. This request is partially granted. Any affected person wishing to comment on the draft tariffs in the above-mentioned file may do so by no later than Friday, March 22, 2019, by sending their comments to the Board. PS - the Board has now put the foregoing Notice [CB-CDA 2019-014] on its website. The long-awaited hearing in the appeal of the Federal Court’s decision in Canadian Copyright Licensing Agency v. York University, 2017 FC 669 (CanLII), will take place on March 5 and 6, 2019. As followers of this case will know, I attempted to get leave to intervene for the Canadian Association of Research Libraries (“CARL”). Unfortunately, in my opinion, the motion for leave to intervene was dismissed and a motion for reconsideration of that decision was also dismissed. I conclude that the statutory licensing scheme does not contemplate that licences fixed by the Board pursuant to s. 70.2 should have a mandatory binding effect against users. However, this case does not require this Court to decide whether the same is true of collective organizations. It may be that the statutory scheme’s focus on regulating the actions of collective organizations, and the case law’s focus on ensuring that such organizations do not devolve into “instruments of oppression and extortion” (Vigneux v. Canadian Performing Right Society, Ltd., 1943 CanLII 38 (SCC),  S.C.R. 348, at p. 354, per Duff J., quoting Hanfstaengl v. Empire Palace,  3 Ch. 109, at p. 128) would justify finding that the Board does have the power to bind collective organizations to a licence based on the user’s preferred model — transactional or blanket — on terms that the Board finds fair in view of that model. However, this issue was not argued in this case. I find that licences fixed by the Board do not have mandatory binding force over a user; the Board has the statutory authority to fix the terms of licences pursuant to s. 70.2, but a user retains the ability to decide whether to become a licensee and operate pursuant to that licence, or to decline. The elephant in the room is the issue of whether Copyright Board tariffs are mandatory. They are not. I successfully argued that case in the Supreme Court of Canada (“SCC”) three years ago – but most of the copyright establishment is in denial or actively resisting. A tariff that sets the maximum for a train ticket from Ottawa to Toronto is fine – and we used to have such tariffs before deregulation. But travellers were always free to take the plane, bus, their own car, a limousine, their bicycle or use any other legal and likely unregulated means. There is intense litigation ongoing between Access Copyright and York University – now in the appellate stage and other litigation in the Federal Court involving school boards. Unfortunately, York failed in the trial court to address the issue of whether final approved tariffs are mandatory.Hopefully, the FCA and maybe the SCC if necessary will get this right in due course. But we can’t be sure, and the other side is lobbying you heavily on this issue, including with such devious and disingenuous suggestions as imposing a statutory minimum damages regime of 3 – 10 the tariff amount on the totally inappropriate basis of symmetry with the SOCAN regime – which is the way it is for good reasons that go back more than 80 years but would be totally inappropriate for tariffs outside the performing rights regime. I urge you to codify and clarify what the SCC has said in 2015, consistently in turn with previous SCC and other jurisprudence going back decades – that Copyright Board tariffs are mandatory only for collectives but optional for users, who remain free to choose how they can best legally clear their copyright needs. of an interest in the copyright by licence. R.S., 1985, c. C-42, s. 13; 1997, c. 24, s. 10; 2012, c. 20, s. 7. For greater certainty, it is deemed always to have been the law that when the Copyright Board approves or certifies a tariff, whether interim or final, the collective to which that tariff applies cannot demand higher royalties or demand more onerous related terms and conditions than those approved by the Board, but the duty to pay such royalties and comply with their related terms and condition applies only to a user who has paid or offered to pay the royalties under such a tariff. A user who has not offered to pay such royalties may nonetheless be liable for copyright infringement. 2) Canadian Broadcasting Corp. v. SODRAC 2003 Inc.,  3 SCR 615, 2015 SCC 57. See paras. 101 – 113. The factum presented to the SCC as prepared by myself, Prof. Ariel Katz and Prof. David Lametti, as he then was, is available here. 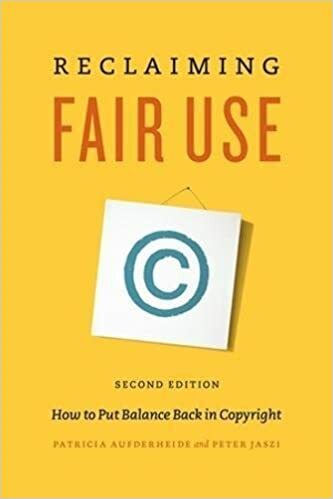 I took some time during fair use/fair dealing week to belatedly look at the second edition of “Reclaiming Fair Use” by Patricia Aufderheide and Peter Jaszi published last year by the University of Chicago Press. This is an update of the first edition published in 2011 by the same authors. The book, by its nature, is primarily about the American landscape of fair use. However, it is an important book for Canadians. Despite the significant scholarly credentials and accomplishments of the authors, the book is written in very plain language that bridges the gap between lawyers and laypersons. Both will find it useful and appealing. There are no footnotes – but lots of references, which are now, of course, easy to track down through the obvious sources on the internet. The book examines the culture of fair use, and the development of the doctrine in the law, the courts and above all in the real world of education, films, etc. It includes a good list of various Codes of Best Practices and a specific Statement of Best Practices for documentary film makers, a subject dear to my heart having done a still useful White Paper for the Documentary Organization of Canada back in 2006. The book is not a legal text, as such, though I have found it useful to confirm in clear, simple and authoritative terms certain contentious points, for example to diffuse the inaccurate statement that the fourth factor in American law concerning the effect on the market has priority over the other factors. See the interesting “kerfuffle” interchange on my blog involving me, Ariel Katz, Bill Patry, Barry Sookman and Dan Glover from 2012. The second edition of the book does have a brief reference to Canada. The authors credit David Vaver, Michael Geist, Ariel Katz, myself and Laura Murray for having “helped to persuade the courts there [Canada] – and particularly the Supreme Court – to apply fair dealing with an emphasis on interpretive openness and technological neutrality. This approach is justified in part by the fact the Canadian judges explicitly regard fair dealing as a users’ right.” This comment is very flattering. However, one hopes that the next edition may have more about Canada – perhaps a whole chapter? The only other reliable books of which I am aware of interest to Canadians that are written in language that both lawyers and non-lawyers can appreciate are by David Vaver – but they are out of date on the topic of fair dealing and the 2012 legislation and “pentalogy” case law. There are also numerous posted guidelines about fair dealing in Canada from various institutions. Some of these are more reliable than others. I am admittedly partial to the guidelines I helped to draft, namely those of the University of Toronto. Readers should be aware of any approach or material that seems too arbitrary or too simple. The Court in BMG was then and is now still rightly concerned that hearsay evidence creates the “risk that innocent persons might have their privacy invaded and be named as defendants where it is not warranted” and such evidence will not suffice if “no grounds are provided for accepting” it. I was proud to argue the BMG case, along with Alex Cameron, on behalf of CIPPIC. Shaw and Telus also put up a very good fight for their customers privacy then and did the heavy lifting on cross-examination. Bell and Rogers were at least somewhat supportive of their customers’ privacy. Videotron supported the record companies. Here’s a still useful balanced analysis of this case by Richard Naiberg, counsel for the record companies on appeal and me. Teksavvy is to be commended for standing up for its customers’ privacy in this instance. Unless today’s ruling is overturned on appeal, which seems unlikely, the inevitable question will be how this ruling might affect other similar copyright mass litigation “Doe” cases if they rely on similar evidence to obtain the Norwich disclosure orders. In the battle of “piracy” v. “privacy”, it’s good that the balance in Canada has been significantly restored. Access Copyright Post Secondary Tariffs - 2011-2013 & to 2014-2017 - Coming Soon to a Campus Near You? The Board wishes to consult Parties on issues of tariff wording before proceeding to certification. More specifically, the Board seeks comments on the two attached draft tariffs, for the periods of 2011‐2014 and 2015‐2017. The text of these tariffs is based, respectively, on the 2012 AUCC Model Licence (Exhibit AC‐2V), and the University Three‐Year Premium Licence (Exhibit AC‐23N). Portions of the tariffs in respect of rates and interest factors have not been included in the attached versions. Parties shall comment on the feasibility and clarity of the terms of the tariff. Comments shall be filed by no later than Thursday, February 28, 2019. The Board has kindly provided me with a copy of the two “draft tariffs” referred to in the Notice. The draft 2011-2014 tariff can be seen here. The draft 2015-2017 tariff can be seen here. The only two “parties” still on the record at this point are Access Copyright and one Mr. Sean Maguire, a self-represented student who has objected to reprographic and private copying tariffs over the years. All of the parties (most notably AUCC – now Universities Canada and ACCC - now Colleges and Institutes Canada) that might have brought adequate resources and expertise to the table to make this an adequately contested hearing have long since withdrawn for whatever reasons. So, with all due respect to Mr. Maguire, this is effectively a default proceeding with potentially complex ramifications flowing from this fact, as I have discussed. The timing is interesting. The Board’s Notice suggests that it is ready to issue a decision soon. It should be noted that this proceeding began on June 12, 2010 – almost nine years ago – when the proposed tariff was published in the Canada Gazette. The “mandatory tariff” issue could – and indeed should in my view – be the main issue in this appeal. More about that, an issue, with which I’ve been very involved, in due course.